You may have seen a video or two of the viral marketing series Will It Blend?. If you haven’t, you’ve missed some entertaining and educational trivia. A host gives us upbeat patter while dropping unlikely objects into a kitchen blender. The host then turns on the blender to show us what will happen when the objects are blended. I love watching this show. It’s fascinating to see stuff get crunched up and smoothed out. Interestingly, a really good kitchen blender works so well not because of the blades but because of science. Something called cavitation. Basically, the blades spin so fast that they tear holes in the liquid you’re blending. It’s the resulting bubbles of air that actually do the work of smoothing the stuff into a liquid. Even though it isn’t, my kitchen blender could be the blender on that show. Well, technically, it’s my husband’s blender since I gave it to him for a combined “all the gift-giving days” gift a few years ago. But we’re pretty good at sharing our toys, so he lets me use it whenever I want to – which is very often. In fact, it’s quite possible that I use it more often than he does. I love how that works. Anyway, the point is that we have simply the greatest kitchen blender available to the general public. It’s the brand they use at Booster Juice, last time I checked, and many other commercial establishments. Our kitchen blender is the Vitamix. My favourite thing to do at a Home Show is to find the booth where they’re selling the Vitamix kitchen blender and watch the performance. It’s very entertaining. You can usually get a very good price for a new machine at a show like this. You also can get one on line, which I did. Not only do you have your choice of models but when we bought ours they had some reconditioned machines at rock bottom prices. Since each and every machine has a lifetime warranty the used machines are a good bet. The reconditioned one we have now is a replacement for the original reconditioned one we had to send back. That was hardly any trouble since they sent the replacement out and we used the same box and packing material to return the temperamental one. Ok, so they charged my credit card when they shipped the replacement and reversed the charge when they got the old one back, big deal. It was still great customer service. This kitchen blender has never let me down. It does just what I expect every time. Of course, I’m someone who reads instructions so I knew what to expect at first. Through experimenting I learned the rest. The company has made some changes since we bought ours but the new one works just the same way. The one we have is now called The Total Nutrition Center. The machine has variable speed settings and switches so you can set it to the perfect speed for the texture you want. The standard 2litre/2 quart jug is good for all but the smallest recipes. The lid fits on easily and securely and has the usual centre button that comes out for adding ingredients. It comes with detailed instructions and the recipe booklet is much more useful than the usual ones that manufacturers throw in. The suggested way to clean it works well. You just fill it half full of warm water, add a drop or two of dishwashing liquid and buzz on high for 30 seconds. The only drawback I’ve experienced with this kitchen blender is that it’s fairly tall so it doesn’t fit under a standard above-counter cabinet. I see you can get different sizes of jugs now so a smaller one might fit your kitchen better. There’s not much else to say because it works great every time! 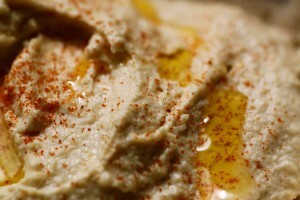 One of the things I make in the kitchen blender is humous. (Spell it however you like, that’s how I spell it.) One day I discovered that, when you have a Vitamix you can make humous even if you’re out of tahini but have sesame seeds. 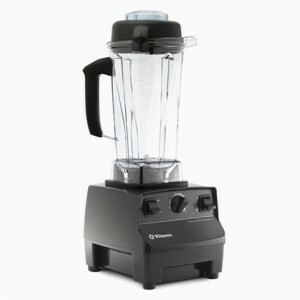 Place all ingredients in the Vitamix blender and blend to a paste. Spread in a serving plate, drizzle with more olive oil, sprinkle with chopped parsley. Serve with fresh pita bread, black olives and yogurt. What’s your favourite kitchen appliance? What do you use make with it?